I was enlightened recently with the idea of living in the moment. I thought this meant just taking the day as it comes, “carpe diem,” rolling with the punches, going with the flow, there’s no time like the present, stop and smell the roses and all the other clichés about living for today. I was challenged recently to really be present-thinking – truly in the existing moment I was experiencing. Confused? I was, totally scratching my head, not sure. After a few explanations, the memory of sitting at the beach began to help me grasp this concept. Sunscreen applied, umbrellas raised, blankets spread, and chairs open and positioned to catch the sun’s warm beams, I sit. I normally have a book, a magazine, a Sudoku puzzle, some form of reading entertainment. But I inevitably find myself just sitting. I hear and see the ocean water as it rises into a wave, reaching its height and then crashing with a hard crescendo onto the sandy shore. I watch the water move in and out, back and forth, pulling me as it lulls me with the rhythm of its movement. I feel the tiny granules of sand with my feet, digging my toes beneath the surface and then the feeling of freedom that overcomes me as they resurface, up, up, up and then the sand trickles down over my feet. My face has been soaking up the warmth of the sun and I savor the gentle breeze that carries the smell of salt through the air. I hear the seagulls speak to one another and watch them soar, mesmerized by their ability to annoy me in unison. Okay, right there would be when I would stop living in the moment with my senses and began to contemplate how I might actually kill one of them. Anyway, I know at the beach I definitely have moments of allowing my senses – taste, touch, feel, smell, see – to help me experience just that moment. I am not thinking about children’s schoolwork, my grocery list, my husband’s job security, the rent, illness, the federal deficit, the price of tea in China. I am living with my senses alert in the precious moment I have been given. I have always thought of myself as a good-time girl. I mean the type of person who does all the clichés I mentioned in the first paragraph. And I am. But I have come to realize how much thinking about the future I do in the moment I have been given. I end up missing the essence of the moment with worrisome thoughts or a to-do list rattling around in my head. This week as I washed my family’s dinner dishes, I stopped. Instead of making a mental list of the evening’s responsibilities still ahead of me or the next day’s agenda, I just allowed myself the moment. The feel of the warm, bordering on too-hot water, the soap suds as they played over my hands, the citrus smell of my dishwashing liquid, the scrubbing of the hardened syrup off the plate. I know these moments are everywhere, all the time. The sound of the car starting, the cries of a child, the mailman opening our on-the-porch mailbox, the final moments of a basketball game, the bacon frying in a pan. I have a choice. Any of these scenarios can bring a flood of questions, thoughts and even potential anxieties, or I can choose to live in the moment – marvel at the sound of the engine, the shriek of life, the hinge of a door, the bounce of a ball and the sizzle of yes, bacon fat. I like this deeper layer of living in the moment, not just on vacation, but in everyday living. I hope your days are full of tasting, touching, feeling, seeing and hearing your moments. 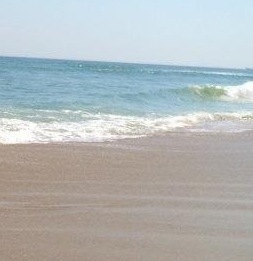 This entry was posted in Life and tagged beach, moment, sand, waves. Bookmark the permalink. And we must live in the moment even during the difficult times. Lessons to learn. Lessons to never forget.